A proton is an example of a hadron. 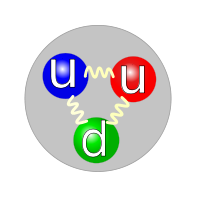 It is composed of two up quarks (u) and one down quark (d). In particle physics, a hadron (from the Greek word ἁδρός, hadros, meaning "thick") is a subatomic particle formed by the binding together of quarks and gluons. The quarks and gluons are held together by what is called the strong interaction or strong nuclear force. There are two types of hadrons: baryons and mesons. Common examples of baryons are protons and neutrons, which are best-known as constituents of atomic nuclei. Examples of mesons are pions (pi mesons) and kaons (K mesons). According to current models, the force (residual strong force) responsible for holding protons and neutrons together in atomic nuclei is explained mainly in terms of the exchange of mesons such as pions. In the 1950s and '60s, scientists discovered many types of subatomic particles that are now classified as hadrons. The concept of quarks was initially formulated to explain these various types of particles. According to the quark model, the properties of hadrons are determined primarily by their so-called valence quarks. For example, a proton is composed of two up quarks (each with electric charge +2/3) and one down quark (with electric charge -1/3). Adding these together yields the proton charge of +1. Moreover, the constituent quarks also carry color charge (nothing to do with visual color). However, a property of the strong nuclear force called color confinement requires that any composite state carry no residual color charge. Consequently, hadrons must be colorless. There are two ways to accomplish this: three quarks of different colors, or a quark of one color and an antiquark carrying the corresponding anti-color. Hadrons based on the former type of combination are called baryons; those based on the latter are called mesons. Like all subatomic particles, hadrons have quantum numbers corresponding to the representations of the Poincaré group: JPC(m), where J is the spin; P, the parity; C, the C parity; and m, the mass. Note that the mass of a hadron has very little to do with the mass of its valence quarks; rather, due to mass–energy equivalence, most of the mass comes from the large amount of energy associated with the strong nuclear force. Hadrons may also carry flavor quantum numbers such as isospin (or G parity) and strangeness. All quarks carry an additive, conserved quantum number called baryon number (B), which is +1/3 for quarks and -1/3 for antiquarks. This means that baryons have B=1 while mesons have B=0. Hadrons have excited states known as "resonances." Each ground-state hadron may have several excited states. Hundreds of resonances have been observed in particle physics experiments. Resonances decay extremely quickly (within about 10−24 seconds) via the strong nuclear force. Under some conditions, hadrons may disappear. For example, at very high temperature and high pressure, unless there are sufficiently large numbers of flavors of quarks, the theory of quantum chromodynamics (QCD) predicts that quarks and gluons will interact weakly and will no longer be confined within hadrons. This property, known as asymptotic freedom, has been experimentally confirmed at energy scales ranging from about one GeV to about one TeV. A baryon is a hadron composed of three "valence" quarks. A baryon is therefore a composite fermion, and it has an odd half-integer spin (where "spin" refers to the angular momentum quantum number). Baryons experience the strong nuclear force and are described by Fermi-Dirac statistics, which apply to all particles obeying the Pauli exclusion principle. Each baryon has a corresponding antiparticle, called an anti-baryon, in which the constituent quarks are replaced by their corresponding antiquarks. Also, each baryon has a baryon number B=1, whereas an anti-baryon has a baryon number B=-1. Well-known examples of baryons are protons and neutrons, which make up atomic nuclei, but many unstable baryons have been found as well. In principle, some baryons could be composed of further quark-antiquark pairs, in addition to the three quarks (or antiquarks) that make up basic baryons. Baryons containing a single additional quark-antiquark pair are called pentaquarks. Based on several experiments in the early 2000s, some scientists claimed to have found evidence for the existence of pentaquarks. However, this evidence has since been refuted. No evidence of baryon states with even more quark-antiquark pairs has been found. A meson is a hadron made up of an equal number of quarks and antiquarks. Each known meson is believed to consist of a quark-antiquark pair—the so-called "valence" quarks—plus a number of "sea" quarks, which are virtual quark-antiquark pairs and virtual gluons. All mesons are unstable. Mesons are also classified as bosons, which are particles with integer (or zero) spin. Each meson has a baryon number equal to 0 (B = 0). Examples of mesons commonly produced in particle physics experiments include pions (pi mesons) and kaons (K mesons). The former also play a role in holding atomic nuclei together via the residual strong force. Hypothetical mesons have more than one quark-antiquark pair. A meson composed of two of these pairs is called a tetraquark. Currently there is no evidence of their existence. Mesons that lie outside the quark model classification are called "exotic mesons." These include glueballs (noted below) and hybrid mesons (mesons bound by excited gluons). Searches for exotic mesons that have different constituents are ongoing. Theoretically, some hadrons can be composed of only gluons, and they have been dubbed glueballs. However, these particles may contain virtual quark-antiquark pairs, in at least some cases, making it difficult to distinguish them from mesons. ↑ 1.0 1.1 Hadrons Stanford Linear Accelerator Center. Retrieved September 10, 2008. ↑ C. Amsler, et al. (2007), Quark Model, in "Review of Particle Physics" Phys. Lett. B667:1. Retrieved September 10, 2008. ↑ 3.0 3.1 3.2 Quarks and antiquarks that impart quantum numbers to hadrons are called "valence" quarks. In addition, a hadron may contain an indefinite number of virtual quarks, antiquarks, and gluons that contribute nothing to the quantum numbers. Such virtual quarks are called "sea" quarks. is the number of antiquarks. ↑ S. Bethke (2007), Experimental Tests of Asymptotic Freedom Prog. Part. Nucl. Phys. 58:351-386. Retrieved September 10, 2008. ↑ Hadrons: Baryons and Mesons The Particle Adventure. Retrieved September 10, 2008. ↑ C. G. Wohl (2008), Pentaquarks, in "Review of Particle Physics" Phys. Lett. B667:1. Retrieved September 10, 2008. ↑ Virtual particles are particles that cannot be observed experimentally but are thought to be involved in physical processes. See Real and Virtual Particles Retrieved September 12, 2008. ↑ Hadrons: Baryons and Mesons Stanford Linear Accelerator Center. Retrieved September 11, 2008. Amsler, C., et al. 2007. Quark Model, in "Review of Particle Physics" Phys. Lett. B667:1. Roos, M., and C.G. Wohl. 2004. Naming Scheme for Hadrons Particle Data Group. This page was last modified on 24 July 2017, at 19:23.